Barbara Bush, wife of then-U.S. Vice President George Bush, is photographed at the debate between Bush and Democrat Geraldine Ferraro on Oct. 11, 1984. Barbara Bush has died at the age of 92. 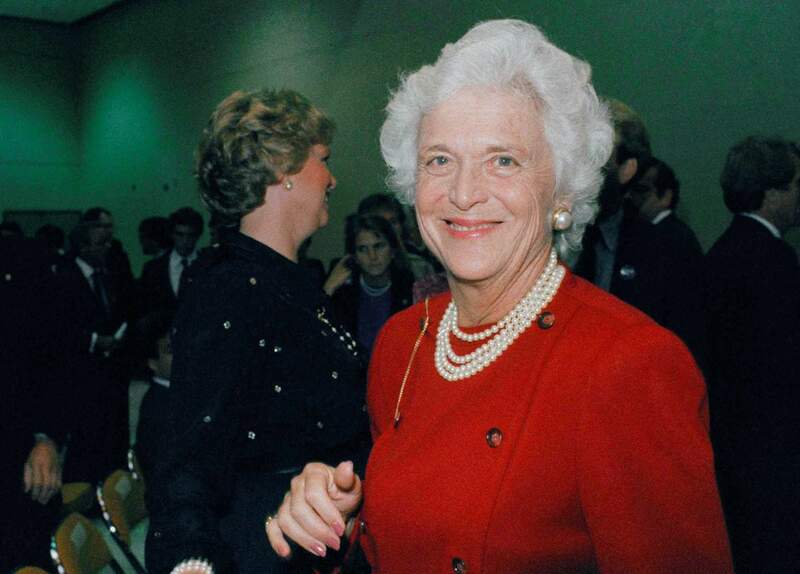 HOUSTON – Barbara Bush, the snowy-haired first lady whose plainspoken manner and utter lack of pretense made her more popular at times than her husband, President George H.W. Bush, died Tuesday. She was 92. Family spokesman Jim McGrath confirmed the death in a statement. The cause wasn’t immediately known. “What you see with me is what you get. I’m not running for president – George Bush is,” she said at the 1988 Republican National Convention, where her husband, then vice president, was nominated to succeed Ronald Reagan. Her uncoiffed, matronly appearance often provoked jokes that she looked more like the boyish president’s mother than his wife. Late-night comedians quipped that her bright white hair and pale features also imparted a resemblance to George Washington. In her 1994 autobiography, “Barbara Bush: A Memoir,” Mrs. Bush said she did her best to keep her opinions from the public while her husband was in office. But she revealed that she disagreed with him on two issues: She supported legal abortion and opposed the sale of assault weapons. In all, the Bushes made more than two dozen moves that circled half the globe before landing at the White House in 1989. Opinion polls taken over the next four years often showed her approval ratings higher than her husband’s.